Reports on the 2002 solar eclipse. An eclipse of the Sun will occur over Southern Africa (and Australia) on 2002 December 04. This eclipse will be total (for up to 80 seconds) in a narrow strip running across the Southern African subcontinent. All areas outside this strip will see a partial eclipse only. Click on each picture below to see the full story. This animation shows what it will be like to see the total eclipse of the Sun. The movement of the Sun in the sky during the eclipse, as seen by people in the path of totality. 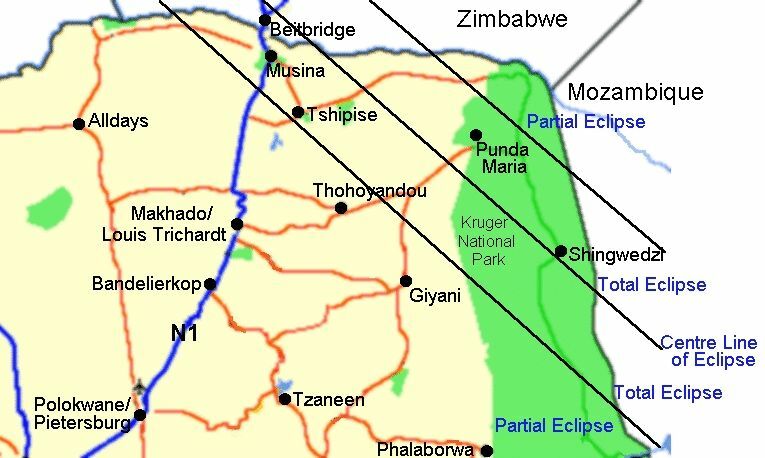 Map showing the path of the eclipse over South Africa. A more detailed, higher resolution map of the eclipse path in South Africa created by the Johannesburg Planetarium. The full path of totality across the Earth. Simulations of the shadow of the Moon during the eclipse. What to do if you will be in the path of totality. Chart showing the bright planets and stars that may become visible in the sky at totality. Animation of the partial eclipse seen outside the path of totality. The example shown is for Johannesburg. Table and images showing how much of the Sun will be obscured by the Moon at eclipse maximum for a number of cities in South Africa. Watch the eclipse safely with pinhole projection of the Sun. Watch the eclipse safely with mirror projection of the Sun. Watch the eclipse safely with eclipse viewers. Watch the eclipse safely with binocular projection of the Sun. Watch the eclipse safely with telescope projection of the Sun. Watch the eclipse safely with No. 14 welders glasses. Unsafe ways of viewing the Sun. It is easy to do it right - don't risk blindness. Viewing a solar eclipse can cause eye damage. HartRAO disclaims any loss or injury howsoever incurred from viewing the eclipse. Photographing the partial and total eclipse. What causes eclipses of the Sun? Do you understand what will happen during the eclipse of 2002 Dec 04, and how to watch it safely? Try our Eclipse Quiz and find out! Educators - try the quiz on your students and colleagues. "Madam and Eve" cartoon creators Rapid Phase have made a wonderful set of child-friendly cartoons using the Madam and Eve characters and the Pezoolies TV characters to explain the eclipse and how to watch it. Download them now from the FEST website - click on the picture at left! A summary of the key points about the eclipse is available as a two page A4 leaflet, in English and other local languages. Make copies and hand them around! Development of this leaflet was funded by FEST - the Foundation for Education, Science and Technology. HartRAO held a three-day workshop at the observatory in July to train educators from science centres and education centres in the northern provinces of South Africa about the eclipse. These centres are carrying out workshops for educator and students in their area. HartRAO is similarly carrying out workshops in Gauteng about the eclipse. This work is partly sponsored by FEST. It is one of a number of eclipse projects they are sponsoring. Some 1200 visitors learned about the eclipse at the Sasol Techno-X science festival held in August in Sasolburg. A pictorial report illustrates how we went about it. In addition, over 40 groups totalling over 2000 visitors that have visited HartRAO since July have have received eclipse education. Ideas for the classroom on understanding the Sun-Earth-Moon system, including eclipses, phases of the Moon and the seasons.